Baseball has long been called “America’s Pastime,” and as time itself passes, the game has grown to encompass that definition – in a negative way. Major League Baseball’s response? Take away one of the unique features that its fans once treasured: its timelessness. But will speeding up the game’s pace of play with new rules that include a running clock recapture a 21st century audience addicted to the faster pace of football? In the past 30 years, football has replaced baseball as the most popular sport in the country. The gap – 1 percent in 1985 – has bloated to 21 percent in the latest Harris Poll in 2014. The outlook gets even grimmer. 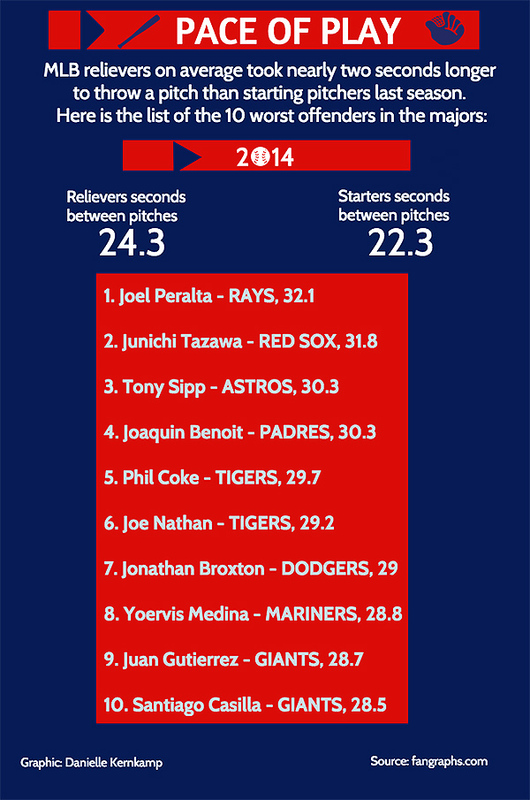 The first game of the 2014 World Series drew 12.2 million viewers, the fewest ever. Nielsen ratings show 50 percent of baseball viewers are 55 or older, up 41 percent over the past 10 years. Little League participation has dropped from almost 3 million in the past 20 years to 2.4 million in 2013. So how does baseball regain its popularity and bring youth back to what was once America’s most revered game? Speed it up, says new commissioner Rob Manfred, who has made it his major priority. In 1972, games averaged less than 2 1/2 hours. Last season games averaged 3 hours, 8 minutes. This, coupled with shorter attention spans, translates into a major problem for the game of baseball, especially among youth. That’s the demographic Diamondbacks President and CEO Derrick Hall wants to target. So is baseball with its early results. Average times for games in the first week of the new season dropped nine minutes to 2:59, the result of tinkering with pace of play rules in the Arizona Fall League in 2014 and spring training this year. MLB took its first step toward changing the rules last fall in the Arizona Fall League. Batters had to keep one foot in the batter’s box, and pitchers were given 20 seconds to throw a pitch. A maximum of three mound visits per game was implemented along with a maximum 2 minute, 5 second break between innings with the hitter required to be in the batter’s box by the 1:45 mark. 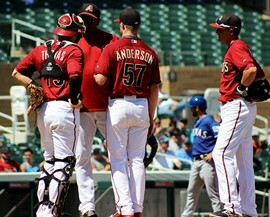 Diamondbacks pitcher Archie Bradley played in the Arizona Fall League last season. MLB didn’t implement the 20-second pitch clock in spring training or the regular season, and Oakland A’s pitcher Tyler Clippard hopes they never do. The league was comfortable enough with the changes to alter them slightly for spring training and then use them into the regular season. Players must continue to keep one foot in the box and will have 2:25 between innings – 2:45 if the game is nationally televised. Managers can now also signal instant replay challenges from the dugout. Reaction around the league has been mixed, with some who don’t see a reason to alter a clock-less game and some who welcome a change. Starting May 1, a $500 fine will be assessed to batters who step out of the box and pitchers who run out of time on the inning-break clock. MLB has already sent out 10 letters to players who violated the pace of play rules within the first five days of the 2015 season. Boston Red Sox designated hitter David Ortiz is a vocal opponent of the fining system. While players may be split, their opinions ultimately don’t matter. These changes are about drawing more fans back to the game and making new fans along the way. A quicker pace means more money if seats are full. The balance between keeping tradition alive and continuous adaptation is delicate. 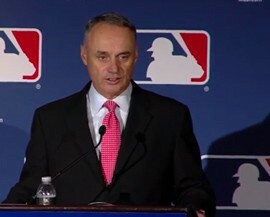 In the first months of Manfred’s tenure, he has shown he’s determined to move America’s Pastime into the 21st century. Whether or not the changes will pay off in the long run remains to be seen. As baseball continues to count its birthdays, so do its fans. In hopes of drawing in a younger audience, a new commissioner has brought the game further into the 21st century, quickening the pace of play in hopes of making it more appealing. 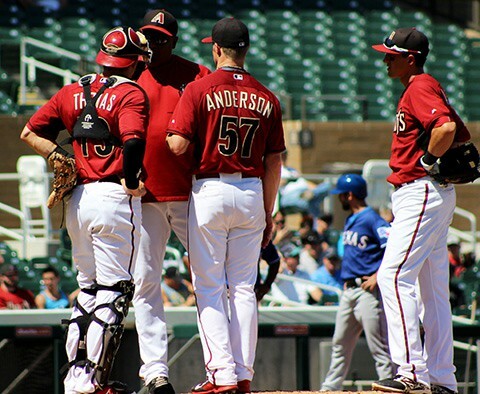 Meetings like this on the mound in spring training are parts of the game Major League Baseball is trying to cut down with the new pace of play rules.